No company likes to spend lots of money on capital investments, although the way Amazon.com has been throwing up fulfillment centers in recent years maybe it is an exception. Sears Holding Corp. of course is the parent of retailers Sears and Kmart. It's no secret that the company has had some operational and financial challenges in recent years, and spending tens of millions in capital to construct more distribution centers to handle growing ecommerce volumes likely was not an attractive option. It's good story that well illustrates the strategic and operational complexity of multi-channel - and the value of DOM technology. So Sears took another route, using a subset of its stores and some existing store DCs and building efulfillment capabilities in them, powered by a internally built Distributed Order Management (DOM) system that decides what orders should be fulfilled where and provides flexibility to adjust those decisions in near real-time based on capacities and other issues at the fulfillment points. The aggressive program earned Sears Holdings the second place in the 2014 Supply Chain Innovation award, as presented last Fall at CSCMP's annual conference in San Antonio. In its case study on the project submitted to CSCMP, Sears noted that "As customers have shifted more of their shopping online, best-in-class competitors are building capabilities by investing in distribution centers throughout the country in order to provide one to two day delivery service to customers. SHC [Sears Holding Corp.] needed a way to improve the speed of online fulfillment quickly without significant capital investment." Ultimately, Sears decided to invest in building fulfillment capabilities in a small subset of its store network as well as a few existing DCs that were being used exclusively for store replenishment. The goal was to provide rapid delivery (two days or less) to the entire country, in part by selecting stores for this new mission that aligned well with UPS' existing delivery network. In addition, Sears needed to strike a balance between having enough stores doing efulfillment to attain the customer coverage it desired with being able to send enough orders to each store such that they could drive efficiencies in their pick, pack and ship processes. Before this new program, Sears had just a single ecommerce-focused DC in the Midwest, which obviously made it difficult for swift delivery to the East and West Coast customers. The store-based fulfillment strategy would address this challenge, additionally supplemented by moving some efulfillment operations into Sears' existing DC network, as mentioned above. The selected outlets were named "Cheetah stores," for the obvious focus on speed. Sears says that its team "developed staff dedicated to online fulfillment in the stores, and engineers worked with the store teams to develop efficient processes for online fulfillment operating in the midst of a retail store environment." It says its engineering teams routinely perform time studies across the network, identify opportunities for improvement, and continue to work with the store teams to adjust processes moving forward. "Consistent, engineered processes lead to reasonable fulfillment costs and member experience metrics compared to the online DCs," Sears says. 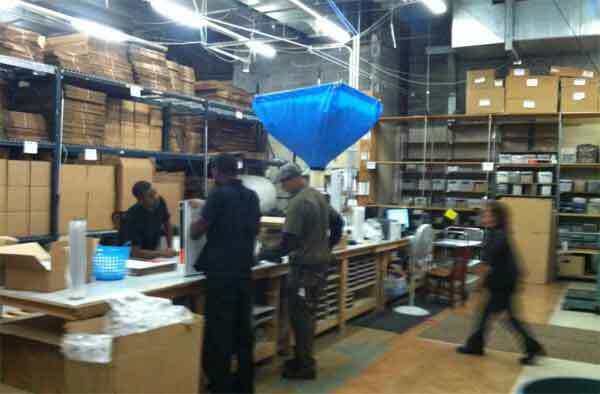 A portion of the back room in these Cheetah stores is converted into an order fulfillment area where picked orders are packed and scanned out for delivery. Orders are typically picked from the floor and staged in the area for packing and shipping, though a few high-moving items are stored right in the backroom, as shown in the photo below.